The System was Developed for Restoration Contractors that Needed Suspended Access without Topside Rigging. 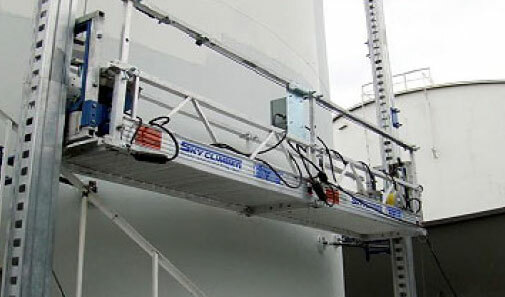 No Top Side Rigging is used on SKYMASTER®. SKYMASTER® is a mast anchor system that incorporates the use of standard Sky Climber platforms or work cages, with standard Sky Climber hoists. Horizontal lifelines are used eliminating separate tie-off points top side. SKYMASTER® is available in single mast work cage or double mast platform system. The compact system can be easily transported in the bed of a pick-up truck. Ease of mobility means immediate savings in transportation and setup costs. 1. Single or double masts are attached to the structure, then single mast work cage or double mast platforms are installed. 2. The workers simply attach their lanyards directly to the horizontal line, stack the mast sections, and climb the structure. 3. When the work on that section has been completed, the workers land the stage, disconnect, move one mast and base, reconnect, and start the process again.